ChildChild age:6-12 years. Under 6 free when not occupying a seat. 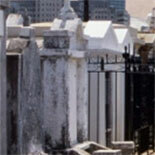 Walk through St. Louis Cemetery #1, the site of the classic movie "Easy Rider," as your professional licensed guide recounts the background of the famous and infamous people who are buried there. 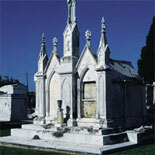 Learn about our unique above ground burial customs and the tombs of various "societies." Make a wish or cast a spell at the tomb of Marie Laveau - the Voodoo Queen of New Orleans - and discover how she was able to be in two places at once. Daily at 9:00am, 10:30 & 1:30pm. Closed New Years Day, Mardi Gras, Thanksgiving Day and Christmas Day.